Spectrum RV is happy to introduce the best built line of Fifth Wheelers ever made. Built from the ground up! - combining Americas ability to make them look like a home - with Australian and European decor. The Sands is the Lightest and Strongest Fifth Wheeler ever built. The Emerald Coast is the Best Looking Fifth Wheeler ever built. 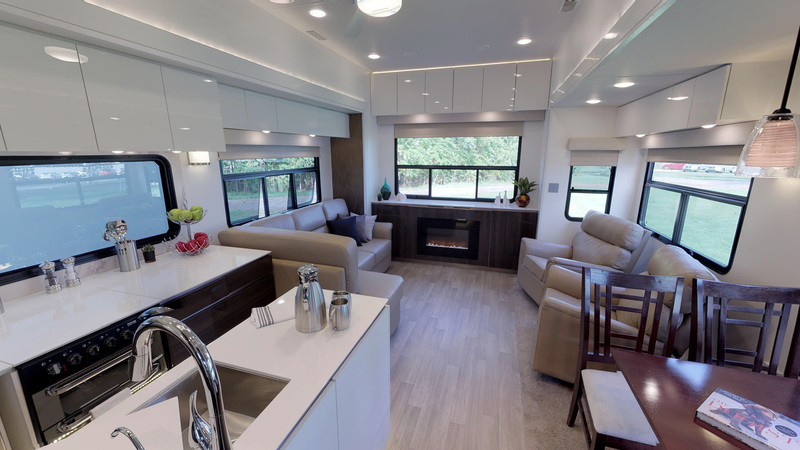 The Avenue is the Most Luxurious Fifth Wheeler ever built. We want you to have the best possible RV experience possible. To do that we offer you the best quality vans at affordable prices. Then experience with us the best training and orientation in the Industry. Back that up with the most comprehensive Warranty in the business and you are assured of a great new lifestyle experience. Come and see what we are working on now, we are located on the ever friendly Gold Coast. You can search RV's to find the size and budget you want, or simply browse our 5th Wheelers to get an idea of which brand you would like. Luxury and Technology are our trademarks. So give us a call, make a time, and come see us soon!